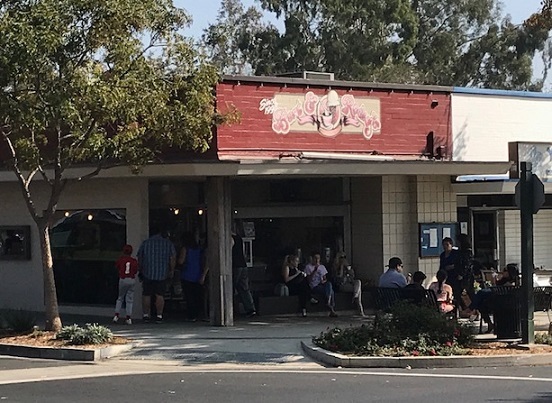 Restaurant of the Week: Bert and Rocky’s Cream Co.
Ice cream and candy shop Bert and Rocky’s started in Upland in 1989 and expanded to Claremont in 1998; the Upland location, by the high school, has closed, leaving the Claremont shop as the mainstay. 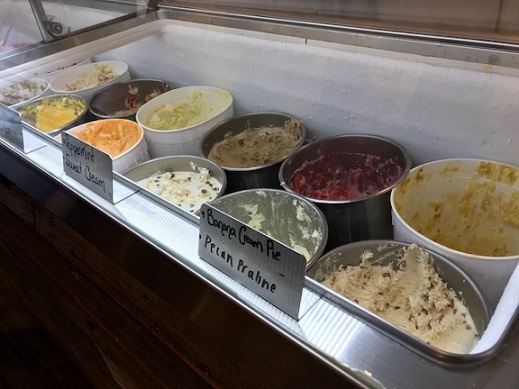 It’s a popular spot with a lot of foot traffic, great homemade ice cream and a community-oriented outlook with school fund-raisers and the like. 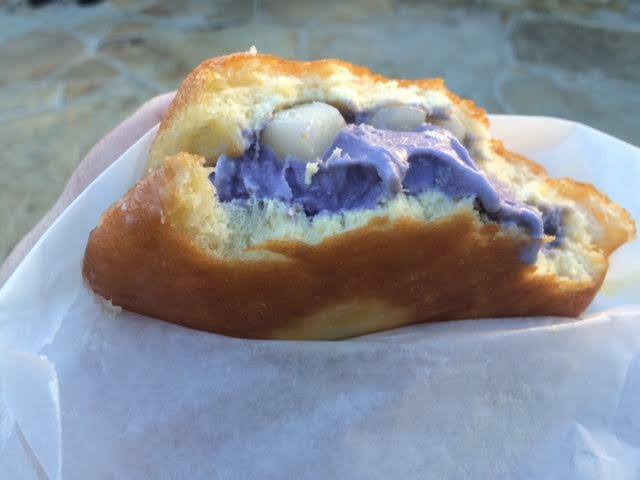 I’ve gone to Bert and Rocky’s since its Village location opened — not frequently, but probably once a year. 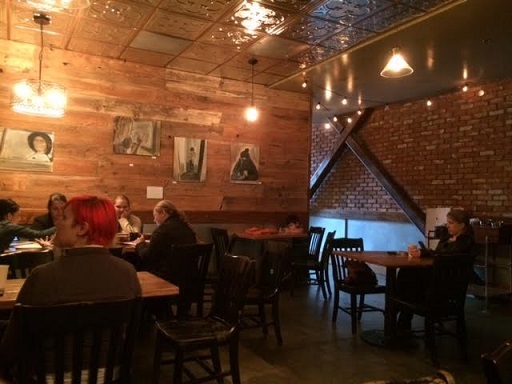 It wasn’t until meeting a friend there during October’s heat wave that it occurred to me to make it a Restaurant of the Week. 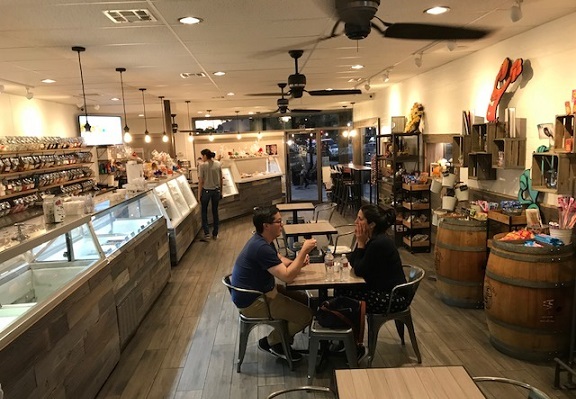 They’ve got a couple dozen ice cream flavors, plus sorbet and other non-dairy permutations, at any given time, available as cones (their waffle cones are housemade), dishes, sundaes, banana splits, freezes and milkshakes. 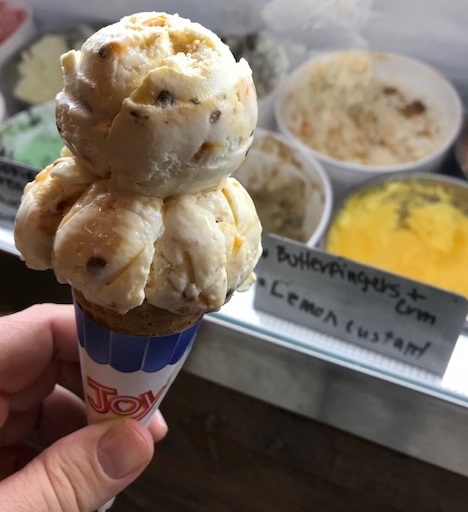 I went for Butterfingers and cream in my go-to size, junior scoop ($3.45). Seems plenty big to me. Bert and Rocky’s also has fudge, bark, caramel apples, chocolate-dipped items, scooped candy and nostalgic packaged candy like Necco wafers. There are a few tables, a bar, some outdoor chairs and, on most afternoons, a crush of customers — but also a friendly and patient staff. 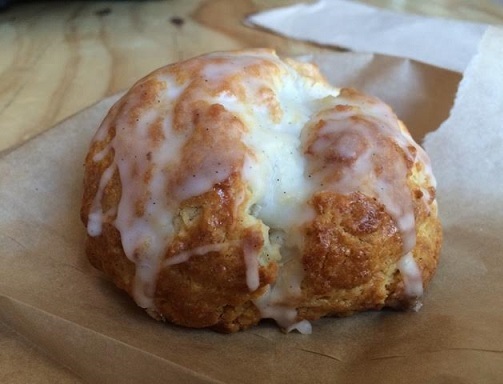 Cream is said to be an acronym for Cookies Rule Everything Around Me; the first opened in Berkeley in 2010. One came to the Ontario Mills area in 2016, sharing space in a building with a Noodle World Jr. across Rochester from the Edwards 22. 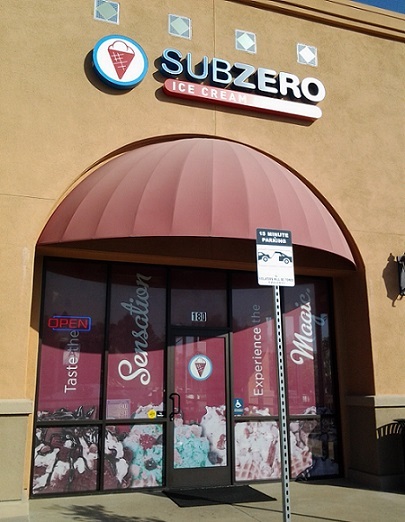 I had meant to try it at the time but forgot the whole thing until Tuesday, when I met a friend for lunch at Rubio’s (which has a new name, Rubio’s Coastal Grill, and new menu since the last time I ate at one; it’s an improvement, btw) and parked facing Cream. 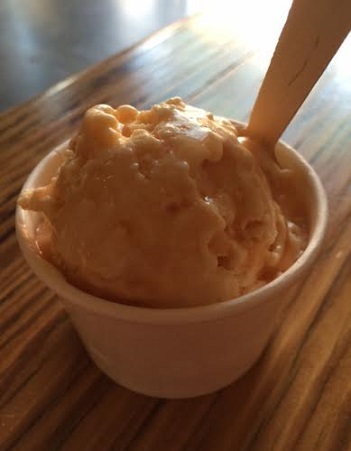 Walking back to my car on a hot afternoon, I decided to hit up Cream before going back to the office. 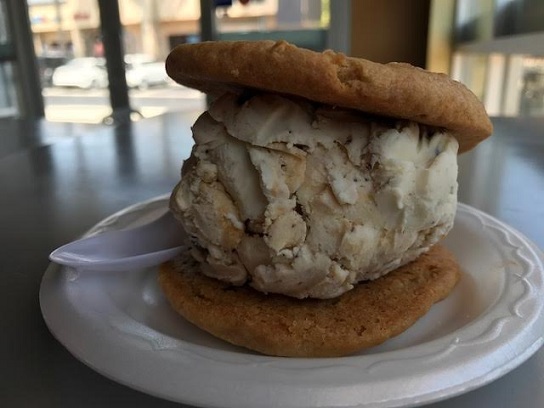 They have two dozen ice cream flavors and more than a dozen cookies (menu is on the website), with the concept being that while you can get one or the other, you really ought to make your own ice cream sandwich. In real life, the cookies are less blurry than in my photo. 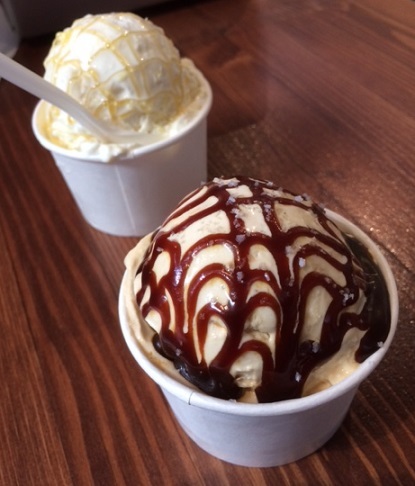 I paired peanut butter twist ice cream with two peanut butter cookies ($4). There’s the option of adding toppings to the sandwich, like chocolate sauce or Nutella, many of them as a drizzle, for another 75 cents, but that sounded messy for eating by hand, so I skipped that step. The server first warmed the cookies for me — mmmm — and the sandwich made for a nice mid-afternoon treat. 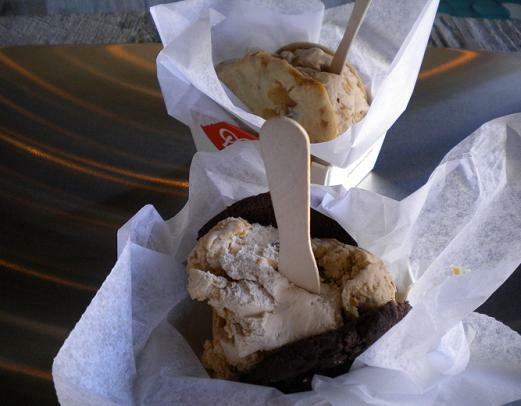 You can get your ice cream in a cone, or get your sandwich with brownies rather than cookies. 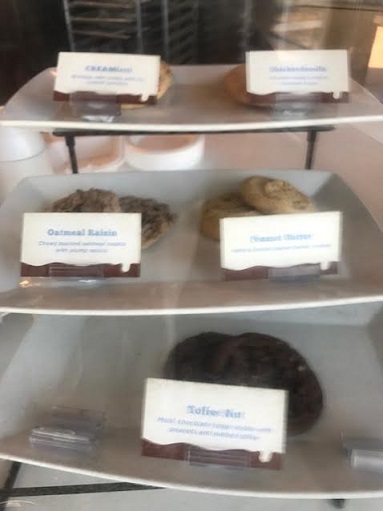 Also worth noting, it’s vegan-friendly, with two soy ice cream flavors (blueberry and mint chocolate chip) and three vegan cookies, as well as three gluten-free cookies. 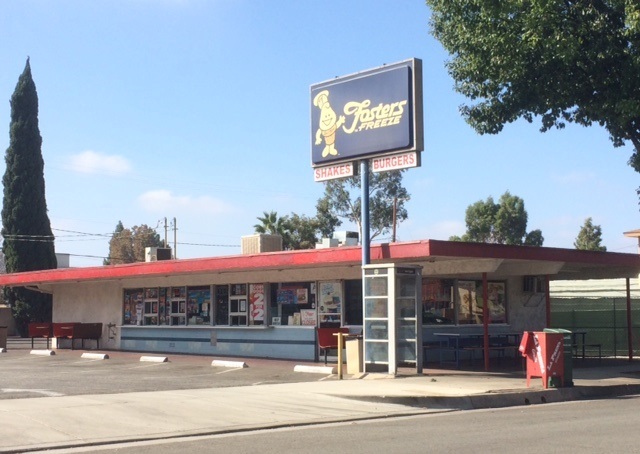 In Glendora a few months ago I spotted this old-fashioned Foster’s Freeze and my Americana-lovin’ heart skipped a beat. There are said to be 88 freestanding Foster’s left in California, many of which are in classic buildings. 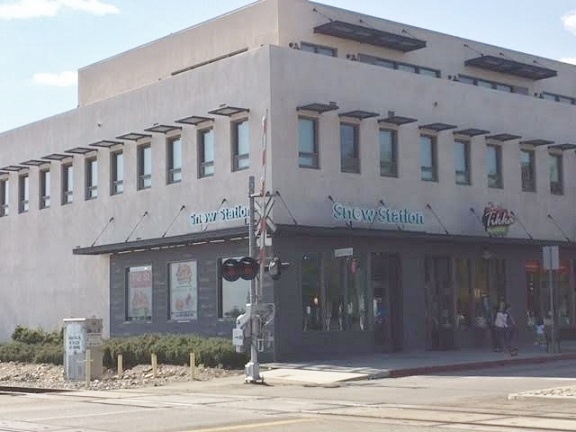 One that I liked in downtown San Luis Obispo, I just learned, closed in 2014. 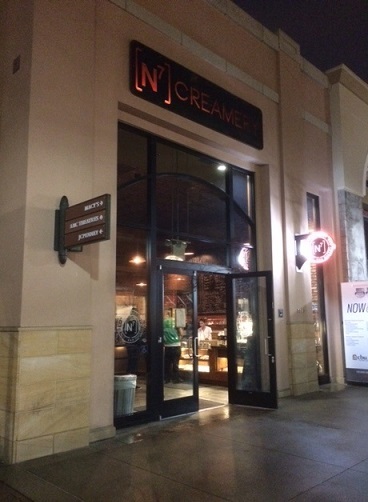 The chain started in 1946 in Inglewood, and that one, at 999 S. La Brea Blvd., is said to still be in business; based on Google Street View, it looks original. 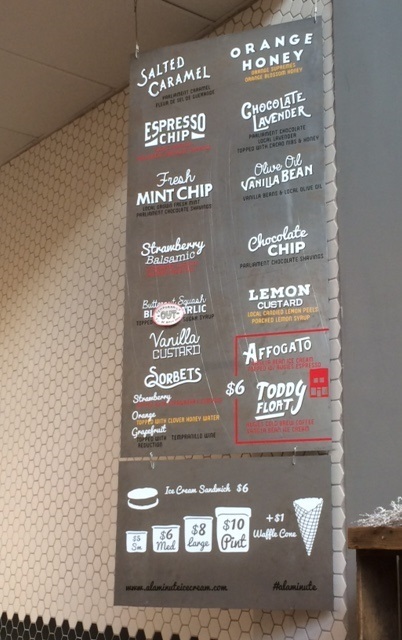 Typically, you have to go to an El Pollo Loco for Foster’s Freeze, and then all they have is ice cream. 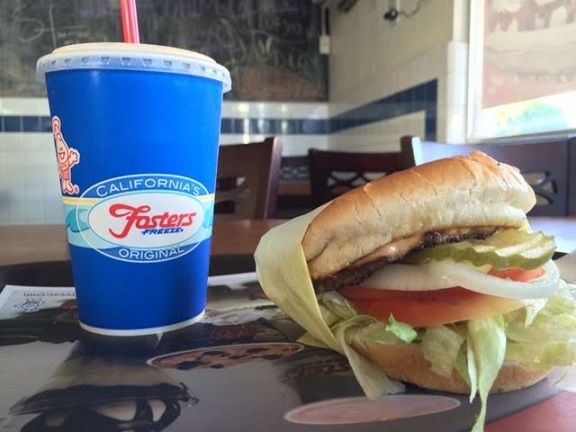 The Glendora location turns out to be the closest freestanding Foster’s to the Inland Valley. On a recent hot Sunday afternoon, Foster’s came to mind and I made the drive. The low-slung building with the covered patio and walk-up window seems very 1960s. (Employees had no idea when it opened.) And is that a phone booth out front? 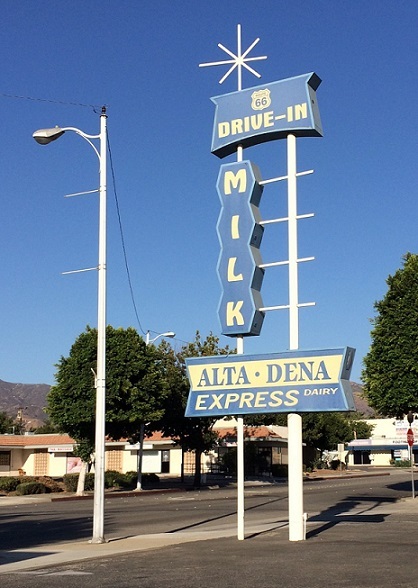 Next door is an Alta Dena Dairy with an awesome sign. As Foster’s has a small dining room, and air conditioning was desirable, I ordered and ate inside: a small hamburger and a pineapple shake ($7.56 total with tax). It was a decent burger with a crunchy sheaf of lettuce, and the shake hit the spot. 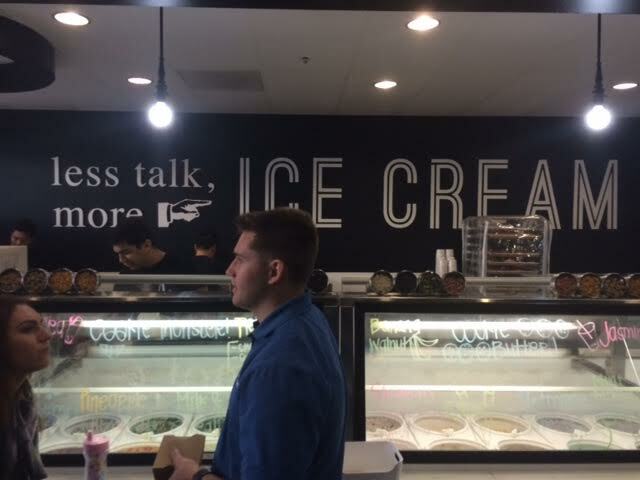 In an unusual touch, a wall-sized chalkboard allows customers to scrawl a friendly message. I’d have taken a photo but someone was sitting in front of it in the otherwise-empty room. If you like this sort of thing, by all means check out Foster’s. I’m sure I’ll go back. 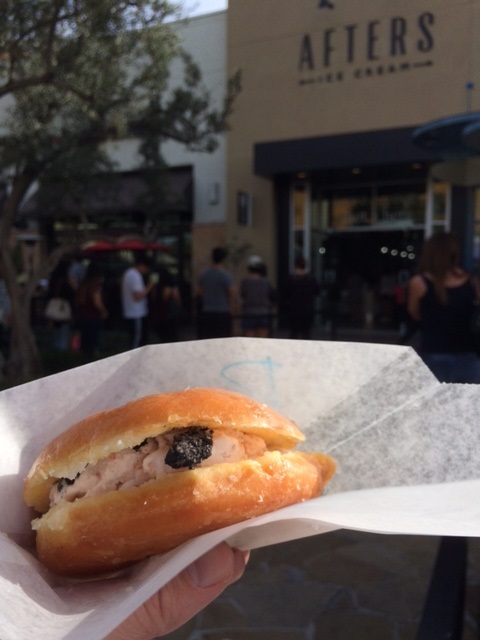 Claremont is a good ice cream town, or more accurately frozen dessert town, for which it doesn’t get enough credit. 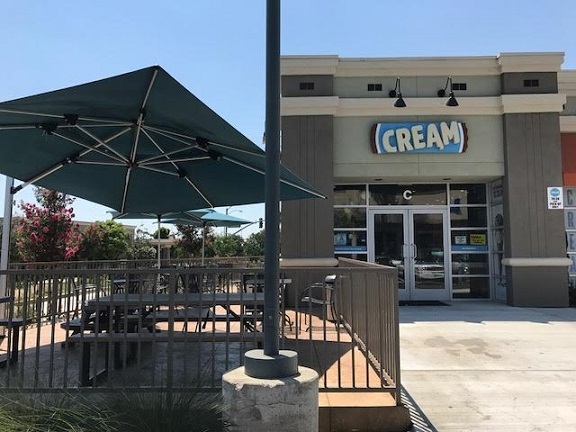 In the Village there’s Bert and Rocky’s (traditional ice cream), A La Minute (nitrogen ice cream), 21 Choices and Yogurtland (frozen yogurt), with another 21 Choices and a Baskin Robbins near each other on Foothill. 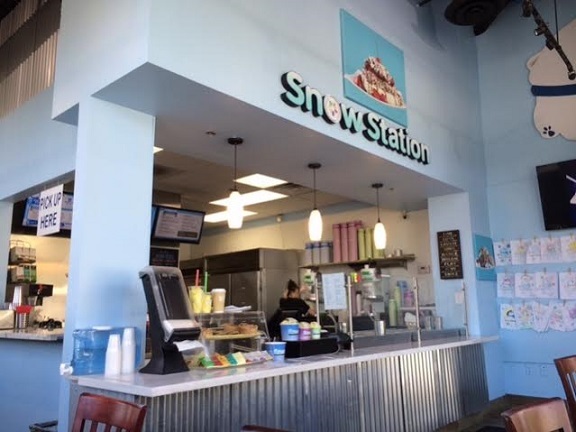 And now there’s Snow Station. Formerly a Verizon store, and then Pie St. pizza, this little shop is at the south end of what we might call the American Apparel building. Blink and you’ll miss it. 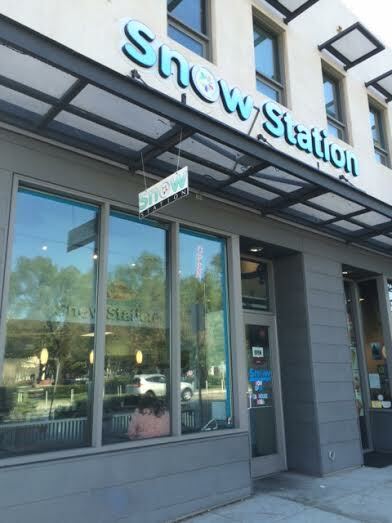 Snow Station appears to be winning the battle despite its location. 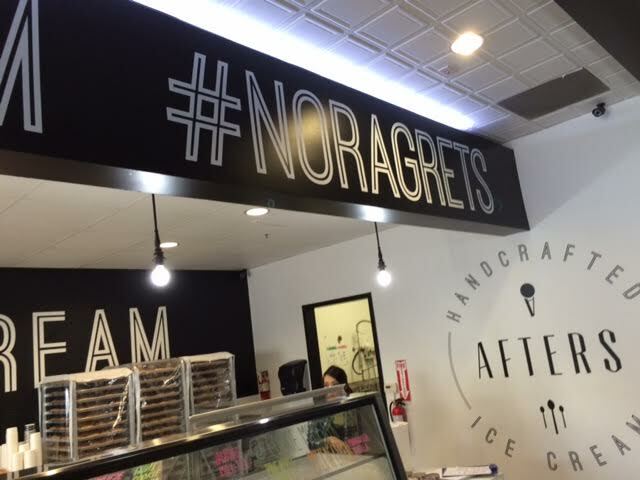 It’s a franchise of a slightly different concept, a vegan ice cream parlor, although it’s not billing itself that way. 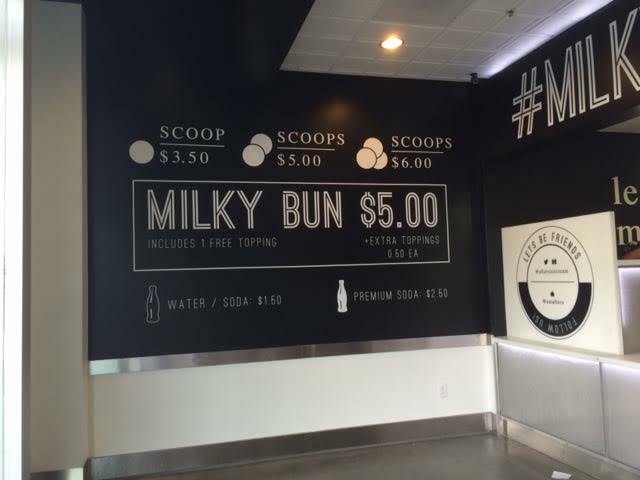 The offerings are described as a blend of ice cream and frozen yogurt, both non-dairy because soy milk is used. 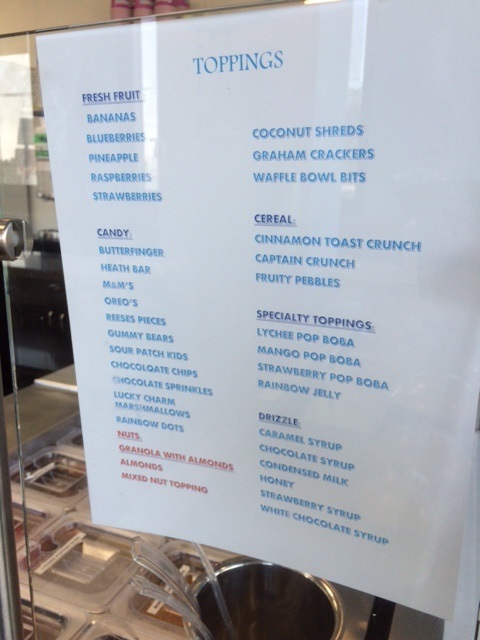 “No longer do vegans and lactose intolerant individuals have to watch while others enjoy ice cream or frozen yogurt,” the back of the menu reads. The result is said to be lighter in calories, which I can believe, because it’s not dense. 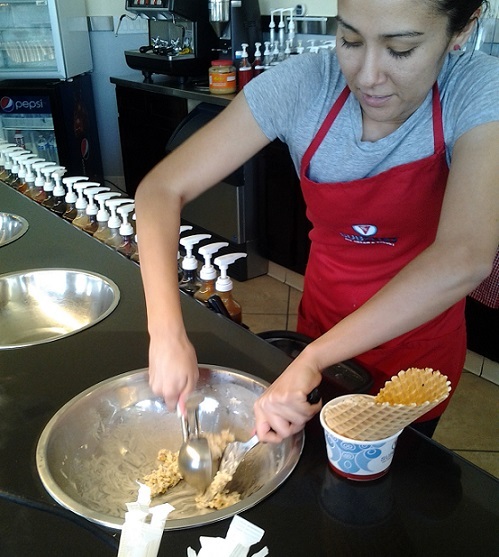 Flavors and toppings are reminiscent of Yogurtland. “This is very refreshing, isn’t it?” my friend said. “It’s very tasty. 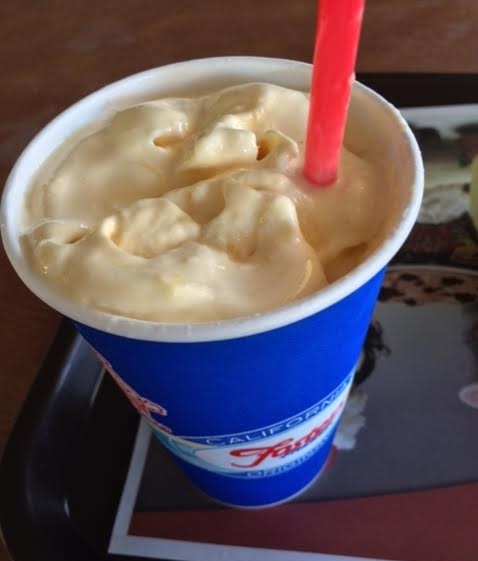 This doesn’t give you brain freeze, either.” I agreed. I liked it enough I went back a couple of weeks later. This time I got pineapple with strawberries and honey, another good combo, at the same size. 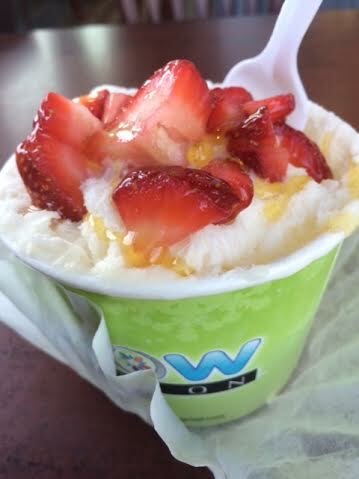 I will say Snow Station isn’t quite as satisfying as traditional, dense ice cream, or even frozen yogurt. Another customer was heard to say, by way of praise, “It’s almost fluffy.” But it’s unique, light and very good. 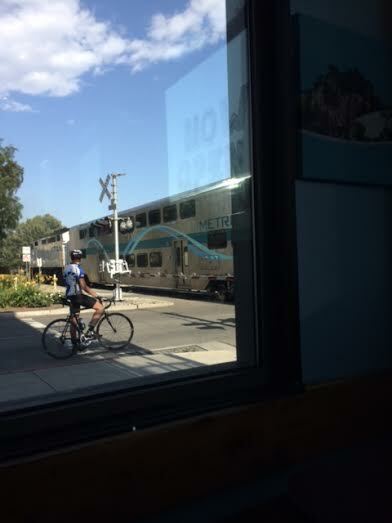 Also, it’s kind of cool when a Metrolink train goes by. 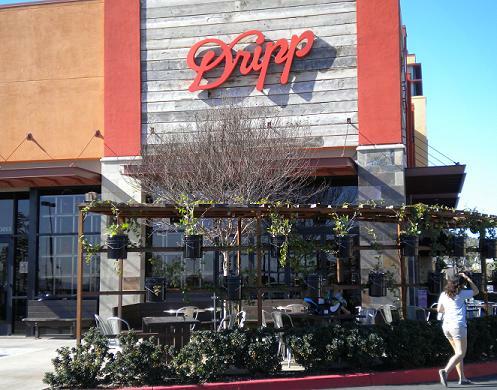 Dripp, a new coffeehouse at the Shoppes center in Chino Hills that opened in November 2011, took the place of a Peets on a busy corner. 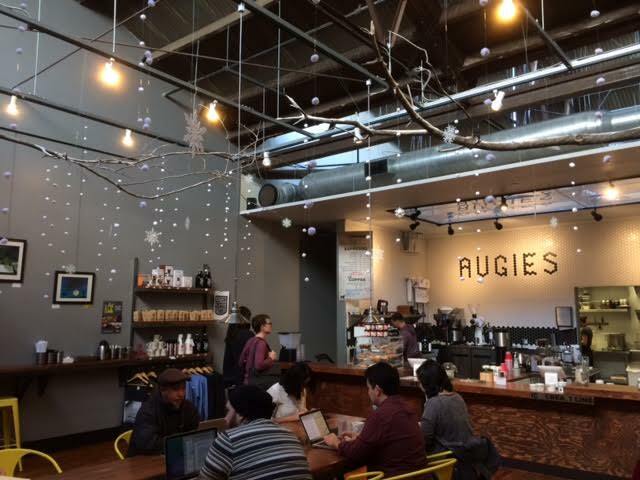 In a surprise to me, this is a one-off coffeehouse, not a chain, although it certainly could become one. 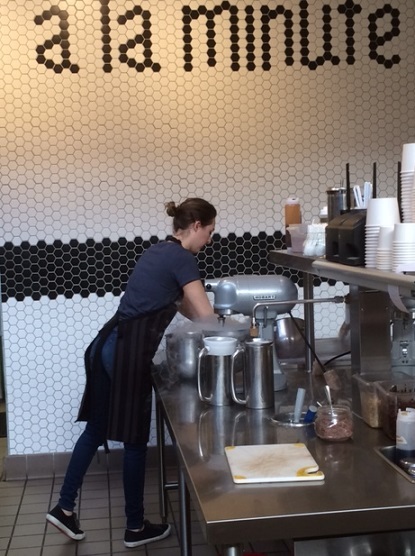 A lot of money was poured into the space to revamp it and install some complex drip coffee equipment. 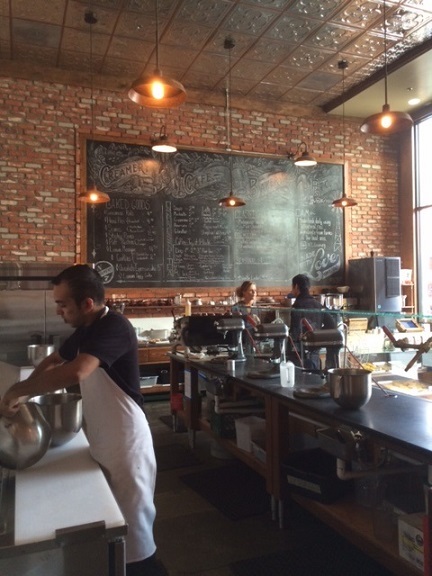 The beans are roasted by high-end LA coffeehouse Intelligentsia. You’ll have to find someone else to explain or critique this aspect (the website uses such terms as “ambrosial coffees,” “flavor-enhancing methods” and “Japanese drip bar”) because I don’t drink coffee. But I visited recently with three friends and they were impressed. 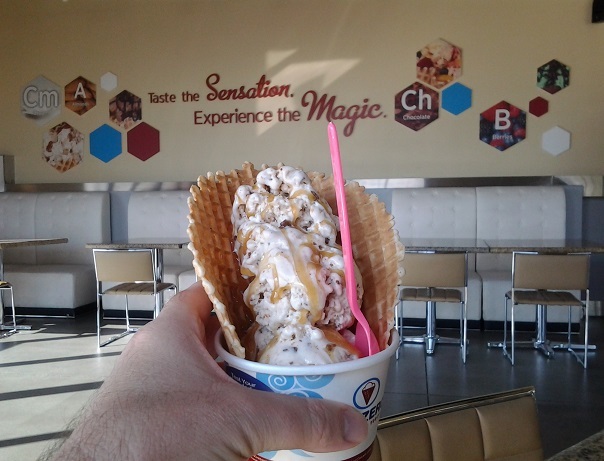 What I can tell you about is the ice cream. 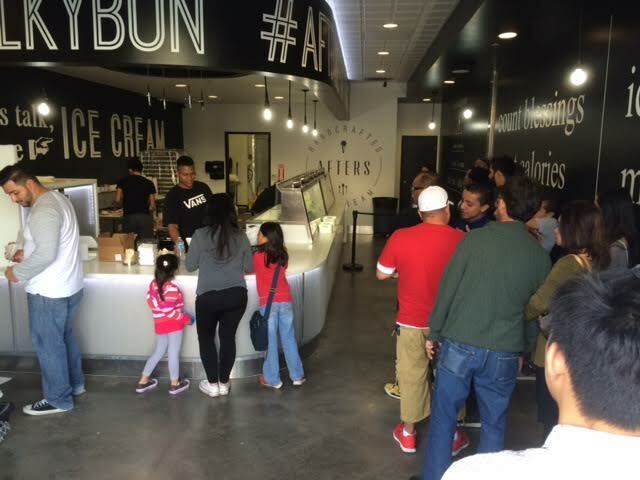 Dripp has eight flavors of ice cream and eight types of cookies. The sandwiches ($4) are made to order and you can choose two different cookie types if you like. I had peanut butter ice cream between two peanut butter chip chocolate cookies. 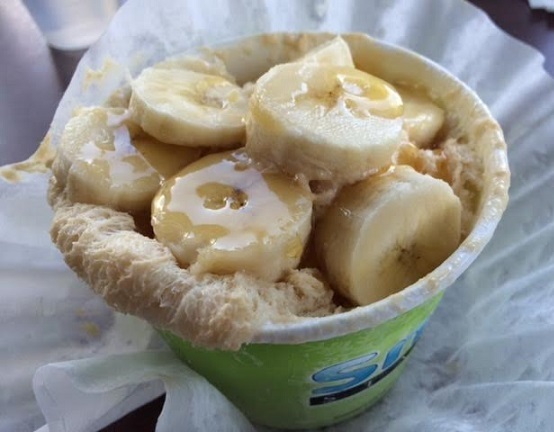 As you can see, they put a spoon in it and that’s recommended for getting started. 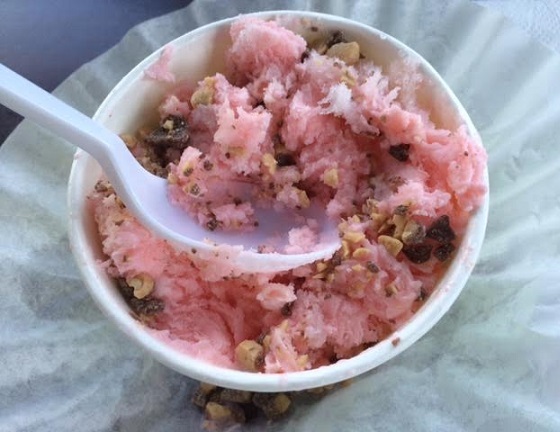 The cookies and the ice cream both were amazing. 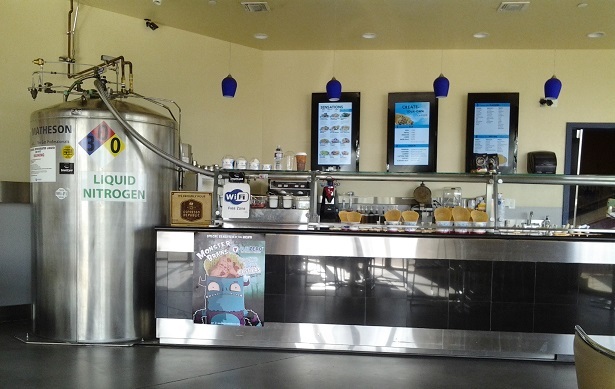 You can also get ice cream solo in one, two or three scoops, or the cookies by themselves. 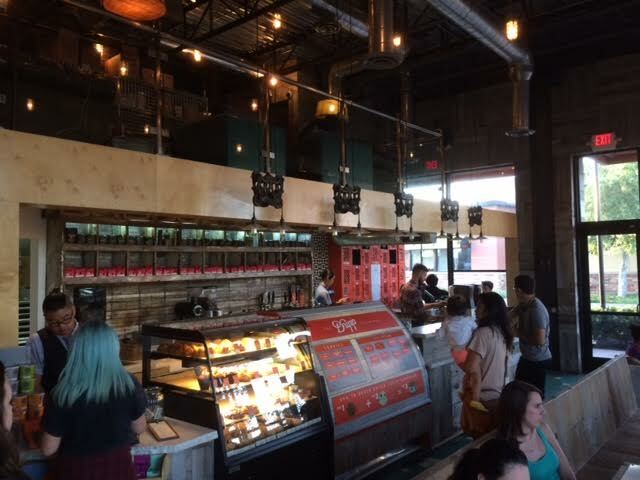 The coffeehouse looks like hipster central: exposed piping, menus attached to pieces of distressed wood, ropes hanging from the ceiling, antiques, a loft upstairs with sofas and chairs. An annoying notice on the door reads “No Photography,” which is roundly ignored. There’s a shady patio outside.